Sentiment analysis also called opinion mining, and it studies opinions of people towards products and services. Opinions are very important as the organizations always want to know the public opinions about their products and services. People give their opinions via social media. With the advent of social media like Twitter, Facebook, blogs, forums, etc. sentiment analysis has become important in every field like automobile, medical, film, fashion, stock market, mobile phones, insurance, etc. Analyzing the opinions and predicting the opinion is called sentiment analysis. Sentiment analysis is done using opinion words by classification methods or by sentiment lexicons. 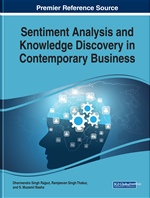 This chapter compares different methods of solving sentiment analysis problem, algorithms, its merits and demerits, applications, and also investigates different research problems in sentiment analysis. The Research of sentiment analysis focused mainly on three methods. 1. Supervised learning methods 2.Extracting Syntactic relations 3.Sentiment Lexicons but two other methods were also used to less extent 1.genetic algorithms 2.Neural Networks. One more classification of research on sentiment analysis 1.Document level 2.Sentence level 3.Aspect level. Supervised learning mostly works on document level. Sentiment lexicons can be implemented on Aspect as well as sentence level. Document level sentiment analysis dealt with one entity Ex: Movie reviews. Document level sentiment analysis is basically a text classification problem where classifier classifies documents of different topics like politics, sciences, sports, Finance etc. whereas Document level sentiment analysis classifies document into positive or negative. Sentence level sentiment analysis deals with subjective and objective sentences. Subjective sentences express opinions whereas objective sentence expresses facts. Aspect level sentiment analysis deals with multiple entities and their features Ex: In Forums, blogs where different entities are compared on their features, Ex The voice quality of mobile is good, Sony’s camera is good compared with Samsung. Lot of Papers has published on the topic of research extracting entity and its aspects (Hu et al., 2004; Kamps et al., 2004). Supervised learning methods (Pang et al., 2002) extracts unigram (words) bigram features from the reviews .Features may be sentiments words, Or Parts of speech tag. Many authors discussed about different methods of generation of feature set and applied different machine learning techniques.But many algorithms won’t work for cross domains because of language constructs.Yet another area of research in Sentiment analysis is cross language. Kim and Hovy (2006) experimented in translating German e-mails to English and applying English sentiment words to determine semantic orientation. Sentiment lexicon uses opinion phrases and words and builds a dictionary based on the synonyms and antonyms of word net. Opinion of the sentence can be found by the number of adjective opinions, verb opinions and their polarity (Kamps et al., 2004).Sentiment analysis finds application in many area like healthcare, automobile, students, feedback analysis, politics, etc (Seki et al., 2016; Ullah, 2016). Sentiment analysis process includes the steps as shown in Figure 1. Reviews from different sources like blogs, social media, forums etc. are the product reviews. Sentiment identification captures sentiment words like good, great, disaster etc. from product reviews. Feature selection is used to find relevant features like unigrams, bigrams, trigrams etc. Sentiment classification and polarity is a process of classifying the source as positive or negative. Different methods for sentiment analysis are given in Figure 2. They are explained in detail in the rest of the paper. Analysis on the methods used in sentiment analysis is depicted in Figure 3.